Before you can legally sell a device that does its thing on the airwaves, you have to get the permission of everyone's favorite government agency, the FCC. 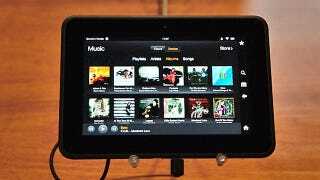 And as of now, the FCC hasn't cleared the new Kindle Fire HD 4G. The delay is probably due to the fact that the Kindle's 4G wireless modem was designed specifically to be thin enough to slip inside the Kindle's case, so it's not just your average modem. It might be a long shot that the FCC actually has any problem with it, but it's still rare to do this kind of large-scale unveiling before you get approval. In fact, there are laws that prohibit advertising non-approved devices, but you can get away with it so long as you include a disclaimer that the device really actually isn't for sale quite yet. Considering the Kindle Fire HD 4G isn't actually for sale quite yet, that's not a big deal, but it is hitching up the pre-order process a little. Basically you're going to have to re-confirm your order once it's cleared, assuming of course that it is. Update: It seems that the 4G may have been cleared after all, the confusion probably has to do with a request that the FCC keep this all on the down-low, presumably to keep anyone from spoiling the surprise before launch. It's worth noting, however, that the disclaimer is still live on the product page for the Kindle Fire HD 4G.